Traditionally, gloss finish bathrooms have been the go-to design for the last few decades but recently, homeowners are choosing to follow new trends making bold changes in their bathrooms by using a matte white finish. This trend has proved popular across a variety of markets including the car and beauty industries, finally making its way to furniture and ceramics around the home. Our brand-new range, the Bagno Metreaux boasts the highest quality matte white products, which are the perfect addition to your bathroom. Matte effect products can look more consistent in colour than a gloss finish, this is because there is no reflection of light which makes some areas of the product look brighter or darker than others. This finish also makes the surface scratch resistant and easy to clean, with the added benefit of any fingerprint and smudge marks proving less noticeable. This is because they feature a clean, natural look and add a touch of authenticity to the room. 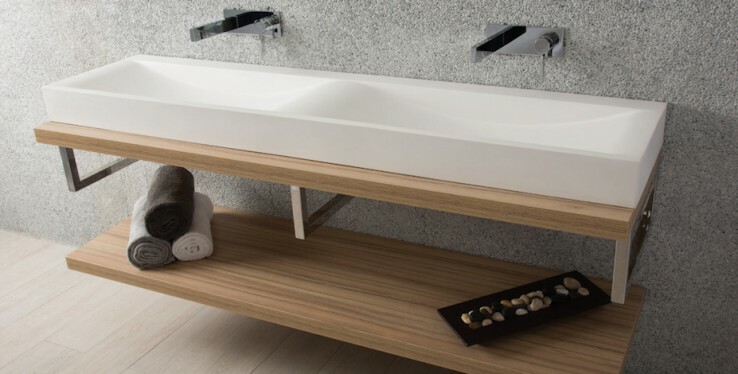 Choosing one of our Bagno Metreaux sinks or toilets provide your bathroom with understated elegance, combined with the smooth texture and colour, it creates a sense of refined luxury, with a wow-factor focal point. If you love to embrace bold new trends, and dare to be different, then try a matte effect bathroom suite. If matte white isn't your thing, Real Stone and Tile still provide ever popular gloss bathroom suites. The gloss finish ranges create a highly polished look and smooth feel and can help create the perception of a larger space, as natural and artificial light bounces off the shiny surface. Fingerprints, dirt and scratches can be more noticeable on gloss finishes, so they require a bit more maintenance. If you fancy viewing our new range of Bagno Metreaux products for your bathroom, pop into our Cheadle showroom or call us on 0161 485 1373. If a sparkling fresh bathroom suite grabs your attention, I would recommend a more traditional gloss finish for your home.